Freddy ve Jason iş başında. Freddy'nin canı sıkılıp Palalı Jason'u diriltip gençleri öldürmeye başlıyorlar. İlk cinayeti Jason, artist oğlanı büklüm büklüm öldürerek filmi izlettiriyor. Ardından Freddy'nin çılgın korku senaryoları ve klişeleri ile devam ediyor. Filmin göl sahnesindeki kaliteli sahneler ile filmimiz son buluyor. İçindeki ve dışarıdaki düşmanlarına karşı korkunu yen. Korkuların seni ele vernesin. Korkunun ecele faydası yok. Freddy Vs. Jason veers in and out of being creative and interesting. It comes across as pieces of a good movie trying to escape the cliched teenage slasher trappings. 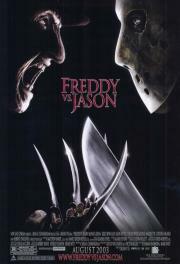 If nothing else, Robert Englund does a terrific job and Jason is imposing as ever. Super corny visual effects with a complete absence of any story or plot. Some entertaining gory kills, but overall a disappointing showing for two of horror's biggest icons. I have a soft spot for Friday the 13th and Nightmare on Elm St, so this was kind of a given for me. It wasn't egregiously bad or anything and it pretty much would have had to have been for me to hate it. During the summer of '03, a 12 year old me routinely frequented my local video rental store, "Couch Potatoes", and systematically rented all the "Friday the 13th" and "A Nightmare on Elm Street" movies in anticipation of this film. Afterwards I dragged my enabling mother to a theater so a friend and I could see it asap. Although dripping with personal nostalgia, during this recent re-watch, despite being far from perfect, the movie is still a surprisingly entertaining entry into both franchises. Really dumb, at least the super jumps/launches are amazing. It's way too campy and the teens are completely interchangeable, the actual fight between the monsters is decent, too bad its short and doesn't really justify the movie.